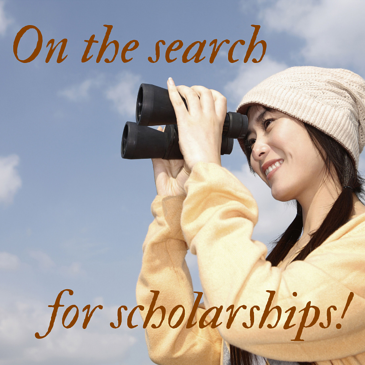 Searching for scholarships can seem daunting. Don't get discouraged. 1) Local Scholarships: Check with the community foundation, organizations, and businesses in the county in which you currently reside. Check with the community foundation, organizations, and businesses in the county in which you graduated high school. Your odds of winning a local scholarship are better than the odds of you winning a national scholarship simply because the number of applicants that will apply is always going to be smaller. 2) Scholarships at the College/University you are going to be attending: Most colleges and universities are going to have a Foundation that offers scholarships for students attending their college. Many but certainly not all are based on what degree you are pursuing. Don't forget to check with the Financial Aid or Student Services Offices as well. 3) National Scholarships: Do not discount these scholarships. Just because they are national doesn't mean you couldn't win them. Many times the scholarship is judged only on a written essay. Search every year. Check back with the community foundations and places mentioned above every year. New scholarships are started all the time, and some are renewable if you reapply. Fill out your FAFSA (FREE Application for Federal Student Aid) as soon as possible. The FAFSA application is open on October 1st of every year. If any of the scholarships you are applying for have a financial need component, most of the time you must attach your SAR (Student Aid Report) from your FAFSA to your application. Check out the U.S. Department of Education's blog for easy-to-follow, step-by-step tutorials on filling out FAFSA forms online. Be mindful of deadlines. Don't start your application at the last minute. Many scholarships have a deadline of December 31st. Apply. Apply. Apply. Simply said - if you do not apply for a scholarship, you cannot win a scholarship. You would be astounded by the number of scholarships that are not given out simply because no one applied. A preference is NOT a requirement. Just because you do not meet a preference listed for a scholarship, doesn't mean you should not apply. For example, Scholarship X has a preference that the applicant be attending OSU Marion Campus. Should you apply if you are not going to OSU Marion Campus? YES, you should. What if there are no applicants going to OSU Marion Campus that year? Well then that year you have an equal chance of winning Scholarship X as all the other applicants. Federal Student Aid is an office of the U.S. Department of Education that deals with financial aid. They have a wide variety of resources on this subject. Another great resource for financial aid is the Financial Aid Office of the college or university you will be or are attending. FinAid.org offers students a one-stop shop for information on all types of financial aid and financial aid resources. HonestProductReviews.com is a website dedicated to create honest product reviews, free of all the fake spam on the internet. It's a goal they strive for using Honest and Technology. They have put together a research guide for students searching for scholarships, Best Scholarship Search Platforms, that was last updated October 2018. Review.com is a website dedicated to conducting data driven and unbiased research about topics that can help make an impact in people's lives. With over a million different scholarships available, they found that for many students finding all the available scholarships can be a real challenge. After countless hours of researching the 17 most popular scholarship search platforms, Review.com analyzed and graded them using five core metrics, including functionality, scholarship availability, quality, application tools, and additional helpful resources. They created a very helpful guide, The Best Scholarship Search Platforms, for students searching for scholarships. This list was last updated July 2018. College Board is a non-profit organization that develops and administers standardized tests and provides resources such as college planning, recruitment and admissions, financial aid, and retention to both students and their families as well as colleges and universities. Their scholarship database is called "Big Future." Fast Web is an online scholarship search engine with additional resources such as financial aid and career advice. Scholly is an online and mobile platform that matches students with scholarships. Caring.com has researched, compiled, and continually updates a list of available Student Caregiver scholarships and information. If you are one of the estimated 1 million young caregivers in this country, make sure to check out their site. Edsmart.org is a website with many helpful articles on furthering your education after high school, including academic success, colleges, programs, community colleges, and more. According to the U.S. Department of Education's Teacher Shortage Areas Nationwide Listings Report, Ohio shows a need for well-trained teachers in all grade levels and especially teachers in art, music, and language disciplines. As teaching requirements vary by state, teachingdegree.org has published guides detailing the process of obtaining a teaching degree and certificate in each state. The Ohio District 5 Area Agency on Aging is awarding two $2000 scholarships for the 2019-2020 academic year. Applicants from Crawford County (in addition to other locations) who are at least at sophomore status in an accredited college or institute of higher learning and are pursuing a degree in a field that would benefit the aging or disabled population (including Nursing, Social Work, Pharmacy, Physical Therapy, Speech Therapy, Occupational Therapy, Dietetics or Gerontology) are eligible. Other eligibility criteria apply. DEADLINE is March 1, 2019. The Crawford Success Center is a satellite school of North Central State College and provides qualified North Central State College students with academic, financial need, and general scholarships for college-related expenses. There are scholarships available for new and current students as well as full-time and part-time students. COLONEL CRAWFORD GRADUATING SENIORS OR GRADUATES ONLY: This scholarship was created by Jim Mayes, CEO/President of J & F Construction & Development Inc. to promote construction management in the business community in Crawford County and surrounding areas. This scholarship shall assist students enrolled in construction and construction-related classes at any 2 or 4 year college or University and assist any students who intend to pursue, or are pursuing, a degree leading to a career in the construction industry or related fields. The paper application may be found at the Colonel Crawford High School Guidance Office or you may download a copy here. The scholarship deadline is May 1, 2019. Please turn the completed application into the CCHS guidance office, and if mailing the completed application to the CCHS guidance office, it must be postmarked by May 1, 2019. Firelands Federal Credit Union awards scholarships each year to graduating seniors. According to their website details for the 2019 Class scholarship will be available in December 2018 on their website. DEADLINE is March 9, 2019. First Federal Community Bank awards two $500 scholarships each year that are renewable for up to 4 years. Keep checking back with them for the 2019 scholarships details. Deadline is March 30, 2018. COLONEL CRAWFORD GRADUATING SENIORS ONLY: This scholarship is in memory of William Ferrell who served as superintendent of Colonel Crawford Local Schools for 23 years, retiring in 1997. The paper application may be found at the Colonel Crawford High School Guidance Office or you may download a copy here. The scholarship deadline is March 15, 2019. Please turn the completed application into the CCHS guidance office. BadCredit.org's Weatlh Wise Scholarship is open to US undergraduates and graduate students seeking a career in the finance industry. Applicants must be a current or future college student (e.g. high school senior). The scholarship amount is $1,000 and will be awarded based on academic merit and submission of a short essay to be titled How the US Credit Scoring System Can Be Improved. DEADLINE is December 31, 2019. See their website for more details. Caring.com not only has their own scholarship, The Caring.com Scholarship from which they award two $1,500 scholarships, but they also have researched, compiled, and continually update a list of other available student caregiver scholarships and information. DEADLINE is June 30, 2019. CGTrader is the largest 3D model marketplace backed by the strong designer community of more than 1 million members. Their goal is to ensure fair marketplace conditions for 3D designers. Each semester CGTrader challenges students to dig into the field of technology by writing different essays on how innovative technologies are transforming our lives. They award scholarships twice a year with deadlines in the summer and the winter. Each scholarship opportunity will introduce a new technology related topic. DEADLINE is December 14, 2018. At EDsmart.org, they know how important it is to get a bachelor’s degree or an online MBA degree, so they are thrilled to announce their scholarship program. One lucky student will be awarded a $2000 scholarship each year. For full requirements and details, please visit their website by clicking the link above. DEADLINE is December 15, 2019. GetBestMattress Scholarship program awards scholarships each year to graduating seniors, as well as current college students. DEADLINE is November 18, 2019. TheZebra.com's goal is to help alleviate the financial pressures of college-bound students, especially since students suffer from higher-than-average car insurance policy rates. To be eligible for the $1,000 scholarship award, applicants must be currently enrolled at or planning to attend a four-year university, graduate program, community college, or trade school located in the continental United States. Students will make and submit a video virtual tour of their favorite road trip destination(s) in their state which is judged on creativity in the content and presentation of their video. DEADLINE is December 31st every year. To complete their commitment to providing unique opportunities for education and personal development, The Recovering Village is offering a $1,000 scholarship to students pursuing a medical-related course of study. Areas of study that will be considered include, but are not limited to, counseling, social work, emergency medicine, pre-med, nursing, psychology (with a focus on addiction counseling or a substance-abuse related field). Simply submit a short essay (no more than 500 words) describing why you are passionate about substance use disorder and mental health treatment. For full requirements and details, please visit their website by clicking the link above. DEADLINE is June 30, 2019. SeniorAdvice.com announced a new $2,000 scholarship for high school and college students throughout North America who have acted as a caregiver to an adult friend or relative in any capacity. DEADLINE is July 15, 2019. ZipRecruiter Scholarship Program awards scholarship two times a year. DEADLINES are June 30th and December 31st every year. Write the most creative essay and win a $3,000 scholarship.